The Rapture is prophesied in the Holy Bible. Rapture Plan B gives you the information you need to understand this coming Event Horizon. Are you ready? Are you watching? 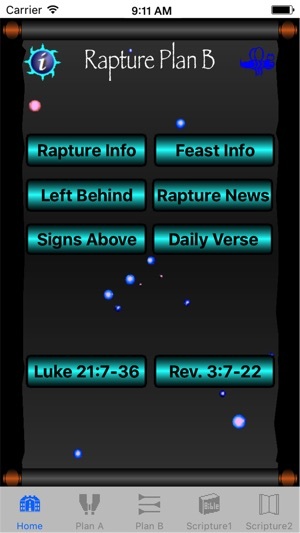 It offers a direct link to Rapture Ready News, features eschatological Bible verses, scours the web for news concerning end times topics, list feast dates, and provides daily Bible verses. The only tweak I'd ask for is the ability to click Back while reading a news article in the app browser and return to the previous page, not the App's home page. Sometimes while reading an article, I click on a related one, and want to return to the previous one for reference. I have not seen an app so technically sound as this one! It's doctrinally sound and it has never given me errors. The information is current and the news is up to the minute. I love the included Bible references. The different areas of information is relevant to the time before the rapture and will be after. It is Great!! The buttons are all links. You don't need an App for that. I hope that updates are quick and meaningful. I know a dollar isn't much but this isn't even close to a dollars worth. Sorry. Requires iOS 8.2 or later. Compatible with iPhone 5s, iPhone 6, iPhone 6 Plus, iPhone 6s, iPhone 6s Plus, iPhone SE, iPhone 7, iPhone 7 Plus, iPhone 8, iPhone 8 Plus, iPhone X, iPhone XS, iPhone XS Max, iPhone XR, iPad Air, iPad Air Wi-Fi + Cellular, iPad mini 2, iPad mini 2 Wi-Fi + Cellular, iPad Air 2, iPad Air 2 Wi-Fi + Cellular, iPad mini 3, iPad mini 3 Wi-Fi + Cellular, iPad mini 4, iPad mini 4 Wi-Fi + Cellular, 12.9-inch iPad Pro, 12.9-inch iPad Pro Wi-Fi + Cellular, 9.7-inch iPad Pro, 9.7-inch iPad Pro Wi-Fi + Cellular, iPad (5th generation), iPad Wi-Fi + Cellular (5th generation), 12.9-inch iPad Pro (2nd generation), 12.9-inch iPad Pro Wi‑Fi + Cellular (2nd generation), 10.5-inch iPad Pro, 10.5-inch iPad Pro Wi‑Fi + Cellular, iPad (6th generation), iPad Wi-Fi + Cellular (6th generation), iPad Pro (11-inch), iPad Pro (11-inch) Wi-Fi + Cellular, iPad Pro (12.9-inch) (3rd generation), iPad Pro (12.9-inch) (3rd generation) Wi-Fi + Cellular, iPad mini (5th generation), iPad mini (5th generation) Wi-Fi + Cellular, iPad Air (3rd generation), iPad Air (3rd generation) Wi-Fi + Cellular,and iPod touch (6th generation).